prayer, as well as to develop prayer habits such as the Morning Offering and the Examen. This responsibility primarily pertains to PWPN's ministry with young adults, a demographic that is sometimes forgotten amidst other apostolic priorities. Many EYM groups are often founded upon a common ethnic background. Ministering to the different EYM groups is also a way for us to serve the different immigrant populations in the Church, a sector that greatly contributes to the vitality of the local Church in Canada. he Pope's Worldwide Prayer Network (PWPN) - formerly known as the Apostleship of Prayer promotes a way of engaging the urgent needs of the world through grounding ourselves in prayer. 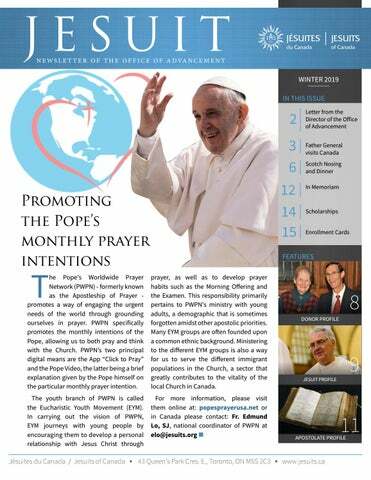 PWPN specifically promotes the monthly intentions of the Pope, allowing us to both pray and think with the Church. PWPN’s two principal digital means are the App “Click to Pray” and the Pope Video, the latter being a brief explanation given by the Pope himself on the particular monthly prayer intention. On August 4, 2018, four Jesuits were ordained to the priesthood in Haiti by Cardinal Chibly Langlois. They are Germain Clerveau, SJ, Amos Estinor, SJ, Eddy Mondestin, SJ, and Jean Bertin St-Louis, SJ. his year marked the 6th Annual Scotch Nosing and Dinner fundraiser hosted by the Jesuits of Canada at Toronto’s Albany Club on October 24. Celebrating Jesuit Contributions to Science T he Province resumed its series of talks on Jesuits in Science with a lecture last fall featuring Deacon Adam Hincks, SJ, a Jesuit scholastic and astrophysicist. “I never considered that I left science to become a Jesuit,” Hincks told the audience gathered at Toronto’s Regis College. A PhD in Physics from Princeton University, Hincks is currently completing a Master of Theology at Regis College. He specializes in the history of the universe and was also selected by the Vatican to be one of four people asked to read an advance copy of the papal exhortation Gaudete et Exsultate, on the call to holiness in today’s world. upporting the Jesuits represents more than attending a Mass, or an event, or sending in a donation; it’s about being part of a larger Jesuit community. A couple that can attest to this is Gail and Bruce Young. “One of things we like about the Jesuits and their staff is that they are constantly praying for their supporters and benefactors,” says Gail Young. “This gives benefactors hope that we are not alone.” Her husband Bruce agrees and says he feels Province members truly do pray for their friends and supporters. “It gives benefactors hope that they are not alone and that this relationship isn’t a one-way street,” he says. One of things we like about the Jesuits and their staff is that they are constantly praying for their supporters and benefactors. To this day, Bruce is still friends with many of the Jesuits he met while in the novitiate and these friendships have extended to his wife Gail. The couple attends Our Lady of Lourdes Jesuit parish in Toronto and Province events like the annual Jesuit Provincial’s Dinner, St. Ignatius Day, ordinations, and a variety of talks. They’ve also been on several pilgrimages with the Jesuits overseas. One pilgrimage included a Papal audience, thanks to a Jesuit. hen many people think of Jesuits they think of men ready to be sent at a moment’s notice to a variety of places to take on diverse assignments. A Jesuit that truly reflects this idea is Fr. J. Winston Rye. From his many assignments in education, to working with Indigenous peoples on reconciliation, to dealing with allegations of abuse, to balancing the books for the English Canada Province, Rye has done it all. His life is a far cry from his humble roots in Winnipeg, MB where his father was a baker from England while his mother was from St. Norbert’s and had Métis roots. At the time, the Shrine was averaging 300,000 visitors and 30-40,000 students annually. But his work at the Shrine was to be short-lived, as Rye was sent to Brebeuf College to serve as rector, president, and then principal. He would be instrumental in evaluating whether the Jesuits should stay at the school. Brebeuf was followed by a sabbatical and some unusual work. Rye was asked to provide CBC-TV colour commentary during Pope John Paul II’s visit to Canada in 1984. Later, he was asked to try out for a part in The Mission, the acclaimed 1986 film about a Jesuit missionary in 18th c. South America, which he declined because he was off to Nepal. There he was approached by an education officer to evaluate a Tibetan Buddhist School under the Dalai Lama. In 1985, Montreal called again and he was off to teach and build a new Loyola High School. St. John’s, NL was another city that needed Rye’s expertise in education so off he went. There he served as principal at Gonzaga High School for four years in the 1990s followed by serving as assistant pastor at St. Pius X parish. St. John’s was a city Rye loved and he knew the challenges faced by educators in the province when Catholic education was under assault. From 1999 – 2003, he served as Principal/President of St. Bonaventure’s College in St. John’s, creating a school from almost nothing in a very short period of time with dedicated and eager parent volunteers. All in all, Rye’s time in education lasted for more than 22 years. he Jesuit presence in Canada dates back to 1611 and their first short-lived mission in Port Royal but the stories of those first companions and all who followed live on at The Archive of the Jesuits in Canada. Located with the Provincial Curia in Montreal, the Archive is responsible for the preservation of documents which reveal that Jesuit history. Every year, over 300 researchers contact the Archive to consult those precious records. And every year, the collection grows to document the ongoing work of the Society of Jesus, its collaborators and its institutions. Thanks to the documentary traces in our archives, we can reflect on the Jesuit journey through Canada’s history and the longstanding contributions of Jesuits as missionaries, explorers, theologians, linguists, educators, scientists, and activists for social justice. While the administrative configuration of the early Jesuit missions in North America and the subsequent Provinces have changed over the course of centuries to best suit the times, the Jesuit influence on society remains as constant as their spiritual values. The archival record serves as testimony and touchstone--reminding us of the achievements and the lessons of the past. Until 2009, the Jesuits of English Canada and the Jesuits of French Canada each operated separate archival repositories, in Toronto and Saint-Jérôme respectively. Jesuits in both Provinces had dedicated themselves to building and caring for their archival collections. A respect for history, an interest in scholarly research and professional stewardship characterized their work. Among the longest serving English-speaking Jesuits, we recognize Edward J. Dowling, SJ whose association with the Archive dates from the late 1940s through to the late 1990s. Jacques Monet, SJ, as a former archivist and the current historian at the Archive, has made a significant contribution not only to archival preservation, but also to the analysis of these records and in the writing of the history of the Jesuits in English Canada. Félix Martin, SJ founded the Jesuit Archive at Collège Sainte-Marie/ St. Mary’s College in Montreal in 1848. He was the first Jesuit to arrive back in Canada following the period of suppression. After 1763, new vocations were banned and the last Jesuit of the old Order, Jean-Jacques Casot, passed away in 1800. Thanks to Father Martin’s collecting, Jesuit legacy holdings were rebuilt. Arthur E. Jones, SJ succeeded Father Martin as Archivist at St. Mary’s College in 1881. He was instrumental in promoting the Jesuit legacy by taking key documents for exhibition in the United States and assisting Reuben Gold Thwaites with the English translation and publication of the Relations. As archeologist and scholar, he discovered and identified Jesuit sites in Huronia. Nicolas Point, SJ (1799-1868) was architect, artist, and educator. While Superior at Wikwemikong, Ontario, he designed the stone church of Holy Cross Mission. The Archive holds six volumes of his travels in North America with over 300 illustrations, including this depiction of the church. decision-making, reporting, and accountability are preserved for their evidential value. Photographer unknown Buildings are well-documented through plans, sketches and photographs. Here are two views of Saint Stanislaus Novitiate in Guelph, Ontario—one taken in 1916, and the second showing the new brick structure of 1949 as novice director Leonard J. Fischer, SJ greets an incoming postulant. During their early years in New France, Jesuit missionaries wrote the Relations as reports back to their Superiors in Europe. They described their encounters with First Nations, and provided travelogues and information about their missionary activities. The Archive holds some of the published Relations, as well as a few manuscript sheets from a Relation that was never published. This illustration shows a title page with the stamp of the Archive Illustration: AJC 0900-0045 at St. Mary’s College. Indigenous language dictionaries from the 17th and 18th centuries are among the greatest treasures held at the Archive. As they learned Indigenous languages, Jesuit missionaries prepared language tools to build their vocabularies and to leave as resources for the Jesuit companions who would follow. This manuscript in its original binding is thought to date from about 1690, and bears the holograph title: Dictionnaire Algonquin. The author has not yet been identified. The Archive in Montreal works in collaboration with the Martyrs’ Shrine to preserve the precious records of its history. An extensive photo collection documents outdoor celebrations of Mass, pilgrimages, the site, its statues, the Stations of the Cross, the Church and its interior, and the iconography of the Canadian Jesuit Martyrs. Here is an early view of the site with pilgrims, and Jesuit novices visiting the Shrine in 1961. Pickering. This did not stop him from making several trips to Anishinabe to visit and fromworking at the Infirmary. Father Gilles Langevin died peacefully on August 31, 2018. He was born in Valleyfield on August 5, 1925. He entered the Jesuit novitiate on August 14, 1945 and was ordained to the priesthood on July 21, 1955. Four years later, he completed a doctorate in theology at the Gregorian University in Rome. In 1960, he taught for ten years in the Jesuit faculties of Montreal and served as guest professor for several Canadian universities. In 1970, he became a professor at Laval University, a position which he held for 25 years. From 1995 to 2000, Fr. Langevin was a consulting theologian to the Canadian Conference of Catholic Bishops. He was also a member of the International Theological Commission, the Pontifical Council on Culture, and the Commission on the Cultural Heritage of the Church. Throughout his career, he was interested in Christology, ecumenism and the relationship between faith and culture. For 30 years, he directed the internationally-distributed, scientific periodical Science et Esprit. He also served as advisor on some 150 religious programs for Radio-Canada. age of 10, after his parents moved to Drummondville. He had to abandon his studies at age 16 in order to work. He contracted tuberculosis at age 17 and was hospitalized for five months. Later he was hired as a handyman, before coming to the Jesuit novitiate, where he was admitted as a brother postulant on July 27, 1952. In his memoire, Bro. Rosaire wrote, “In the Society, I have done just about everything: refectorian, shoemaker, launderer, cook, porter, guest master, and maintenance man.” Bro. Rosaire spent a good part of his religious life in three communities: at the novitiate in Montréal and Saint-Jérôme, then at the residence on rue Dauphine in Québec, and again at Saint-Jérôme. Bro. Rosaire was not only interested in the various works that were assigned to him. He loved to fish and during summer vacations he would spend hours fishing. the novitiate in Montreal until 1950, working as gardener and carpenter. He undertook a series of diverse roles in several Montreal communities, including cooking, which was his primary role first at St. Ignatius College, later at St. Jerome, and then at the associated farm. The St. Regis community appreciated his religious spirit, his even temperament, and his availabilities. In a tribute paid to him on his 25th year of service at St. Regis, it was pointed out that he loved the Mohawk people and their affection was reciprocal. Join our bus pilgrimage May 31 to June 2 as we visit the important sites related to the history of the Jesuits and other sites around Montreal. OUR LADY OF LOURDES PARISH, TORONTO, ON Join us as we celebrate the feast of the founder of the Society of Jesus. This exciting 12-day trip from Sept. 17 to 28, takes pilgrims through some of the most important places of Ignatius’ life: Pamplona, Montserrat, Manresa and more. ALB ANY C LUB , TORONTO, O N A fundraising evening of premium Scotches, fine dining, and fun. For more details on any of the events listed above please contact the Office of Advancement at supportus@jesuits.ca or call 416.481.9154 or 1.855.962.4500. WHAT IS A SCHOLARSHIP? A Scholarship is a sum of money that is invested. The income from this money is used to support Jesuits in formation, current and future ministries, and senior Jesuits. WHAT SUM IS REQUIRED TO FOUND A SCHOLARSHIP? A moderate sum will found (begin) a Scholarship, but a Scholarship is not completed until $15,000 has been contributed. WHAT IS A FOUNDER'S FUND? A Founder’s Fund is a sum of at least $50,000 that annually contributes to the expenses of educating a Jesuit, supporting current and future ministries, or caring for senior Jesuits. WHAT ARE ENROLLMENT CARDS? An enrollment with the Jesuits is a promise to members that they will share in the Masses and prayers that Jesuits of Canada offer for their friends and benefactors. ORDER ONLINE You can always donate and order cards online. Go to www.jesuits.ca, click "Support Us" on the menu, then click "Mass Enrollments & Perpetual Memberships." PERPETUAL ENROLLMENT An enrollment for prayers and Masses. If you would like to send a Perpetual Enrollment, include the name of person(s) to receive the certificate, your name, address, and donation. Let us not do alone what we may do together. FATHER PETER BISSON, SJ Father Bisson served as Provincial of the Jesuits in English Canada from 2012 - 2018. From 2008 â&#x20AC;&#x201C; 2012, he served as Socius for the Province. He has also served as Director of the Jesuit Forum for Social Faith and Justice in Toronto and as an Assistant Professor of Religious Studies at Campion College at the University of Regina. As Provincial, he worked tirelessly on reconciliation between the Church and Indigenous peoples, and on bringing the English and French Canadian Jesuits together into one new Province. SUPPORT THE Your contribution to the Jesuit Office of Advancement provides the needed financial support for the education and formation of our Jesuit scholastics in their vocation to become brothers and priests. Your gift also assists in the healthcare and housing for the older and infirm Jesuits. In turn, the Jesuits are ever mindful of you, our friends and benefactors, in our Masses and prayers.